Social Hideout, 2a/20 Victoria Rd (5 minute walk) Searching for a spot of breakfast? Cross the bridge and head to Social Hideout for Eggs Benedict and coffee in the leafy garden area, or try a decadent cake shake for morning tea. El-Phoenician Restaurant, 328 Church St (2 minute walk) Great for a birthday dinner or a pre-theatre meal. El-Phoenician offers elegant and authentic Lebanese and Middle Eastern dishes, including plenty of options for vegetarians. Bavarian Bier Café Parramatta, 2-8 Phillip St (3 minute walk) Step into this restored church to top up on big servings of beer and hearty German cuisine, best enjoyed with friends or family. The Beir Café is open until late nightly with outdoor seating available. Westfield Parramatta, Church St (11 minute walk) You’re never far away from the latest movie or a spot of retail therapy with over 400 retailers and department stores at Westfield Parramatta. Church Street, Parramatta (5 minute walk) Simply walk down Church Street itself and surrounding streets to find ATMs, fabric stores, florists and travel stores. Church Street Mall Farmers Markets, Church St (7 minute walk) On Fridays, Church Street’s Centenary Square comes alive with local producers of coffee, cheese, bread, fruit and vegetables. 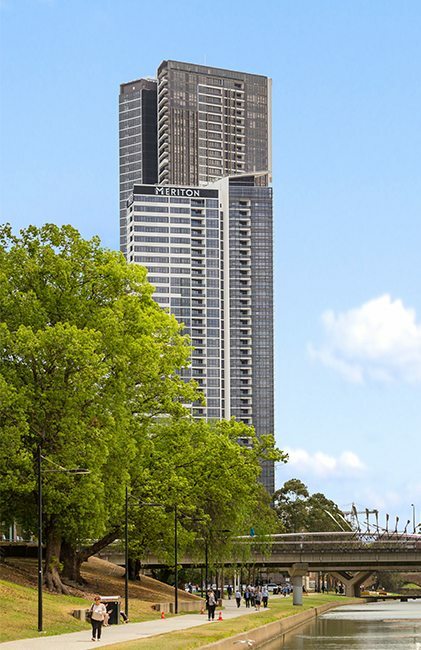 Journey: A 55-60 minute trip from Sydney Airport (Domestic) to Meriton Suites Church Street. Journey: A 45-50 minute trip from Sydney Airport (Domestic) to Parramatta Station, then an 11 minute walk to Meriton Suites Church Street. The free Parramatta shuttle stops near the station and has a stop right near the hotel.